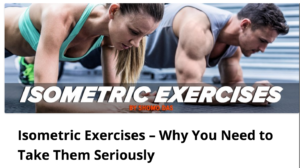 Home Blog New TigerFitness.com Article on Isometric Training! I’m super excited to let you all know that I have linked up with our friends over at TigerFitness.com and will be collaborating with them on delivering some great content! Definitely be sure to go check out the first article I’ve written on the benefits that you can realize through isometric training. Here is the link.